There’s nothing more irritating than having to press your index finger against the bridge of your specs every 30 seconds when you’d much rather concentrate on the task at hand – right? As a woman (sorry men), we know how to multi-task and there’s no disputing that we rock at it. But that doesn’t mean that we enjoy it. Multi-tasking is fine if it’s a necessity and if we feel that we are saving time by doing so. But pushing your specs up to stop them from slipping down to the end of your nose is just really, really, really annoying. So how do we get around this? The problem is, if your spectacles slip down your face, there could be a number of different reasons as to why. And the key to unlocking the right hack is to figure out the cause. Causes range from your ears being too low and your nose being too small to your skin being too oily to your face being too slim – so where do you even start? Mattifying the skin can help your glasses stay in place if you happen to use oily makeup or moisturisers. Washing your face with a cleanser regularly will help to keep it clean and prevent over sebum production. If your oily skin is really hard to control, there are some really great products that can help you throughout the day; such as blotting papers, oil-free foundations by makeup artist and fellow glasses wearer Bobbi Brown, natural clay face masks, or using lemon and other citrus fruits as natural facial cleansers. Keeping the skin oil free will help to keep your glasses in place for longer! Nerdwax is a brand new product designed just for spectacle wearers by a fellow glasses veteran; creator Don Hejny form Nashville has oily skin and claims to sweat a lot, especially when it’s summer. After working outdoors on shows for work, he discovered that his sweat-induced spectacle slippage was out of control and he wanted to design a product to fix this. The wax stick is applied to the part of your frame below the bridge and it’s said to keep your glasses in place for hours! If you can’t get hold of this product, try using natural beeswax – it’s not quite as fancy as Don has perfected his wax formula but it will essentially do the same thing! Just like hack #4, this can be achieved using a heat gun or a strong hairdryer for plastic glasses. Simply heat the temple arms and carefully bend them to create more of a curve – this curved shape will create more of a hook around your ear so the fit will be more secure. 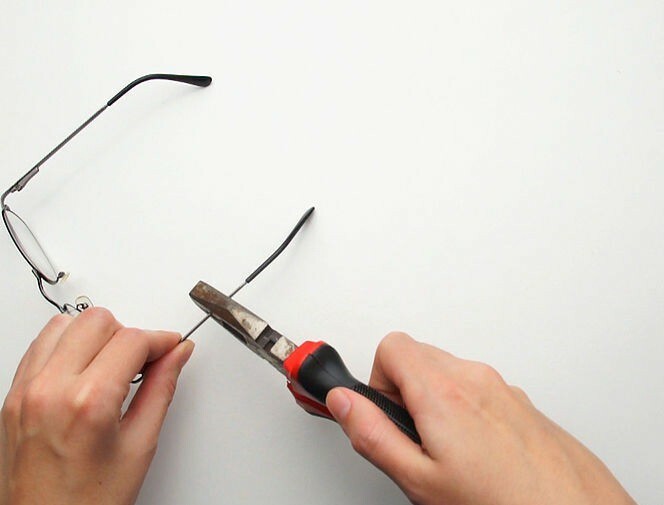 You can also do the same to metal frames using a pair of pliers. Please be aware that all of these hacks are to be tried and tested at your own risk. Anything that requires heat and customisation to your glasses will make them invalid for returns / guarantees. These hacks are simply fab ideas sourced from vloggers, bloggers and other online content creators. We hope they help you get a better fit for your glasses but we sadly cannot guarantee that they will 100% work for you. Do you know of any cool glasses hacks to stop spectacles from slipping? Don’t be afraid to let us know in the comments below. I liked the second tip that you have mentioned above in the article the most, I even tried it and seriously it worked. Besides, one must choose the right glasses wear for eyes, sometimes people pick by the look and style of the glasses…. That is also important, but comfort and durability matters the most and that should never be compromised with the style and trend. Thanks for this nice share!! One of the main problems with glasses slipping is the lack of the rubber nose piece. If you look at glasses youll find one of these two things on the nose side and thats either the same plastic material that makes up the majority of your glasses or these two little rubber oval pieces. And as you can guess plaster slides a lot more than rubber. And yes this does make a big difference. For the first time Ive got glasses without the rubber piece and I cant even hang my head all that much without them slipping or falling off. All my previous pairs with the rubber piece i could literally hang upside down on the monkey bars and theyd be more or less fine. So If your looking for another solution next time you go shopping for a new pair of glasses try looking for the side rubber. You should also add visiting a glasses store! I had some sunglasses that were so big they never stayed on, and they were able to form them to my head a lot better!! !